What does history look like while you’re living it? 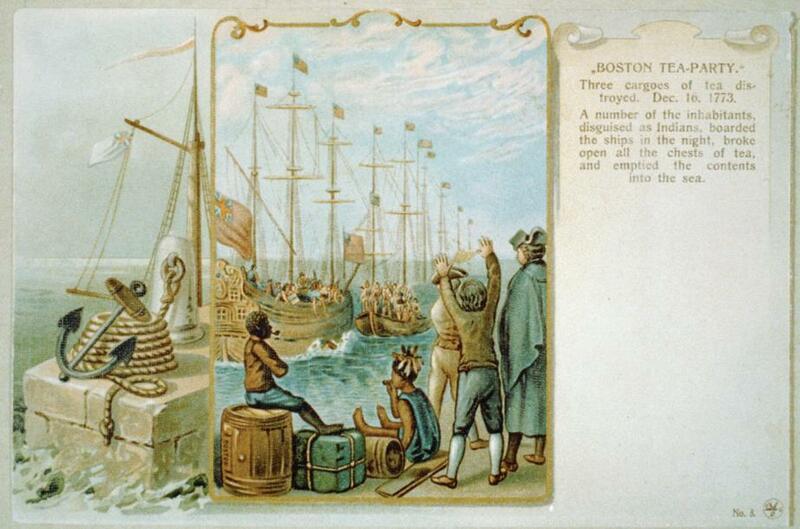 A 1903 reproduction of a 1789 engraving of the Boston Tea Party. Today we mark the anniversary of Dec. 16, 1773, when American Colonists took to Boston Harbor and threw crates of taxed British tea overboard. The Boston Tea Party has become a classic story of the nation’s founding, immortalized in history books as a direct cause of the Revolutionary War. Schoolchildren across the country learn what happened that day, and the event remains powerful enough to have been seized as a symbol by modern political activists. But at the time, to the Colonists themselves, the Tea Party and other events of the American Revolution weren’t yet clear and iconic—they were breaking news. Newspapers, the only mass media of the day, may have moved more slowly than in our Twitter-happy age, but the reporting of events in the Revolutionary War was just as befuddled, partial, and contradictory as the early reports on Hurricane Sandy or Benghazi that ricocheted around the Internet in 2012. 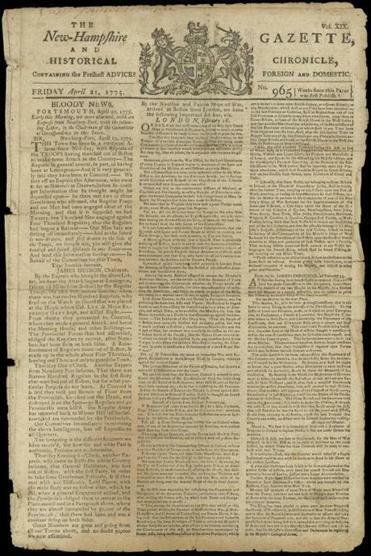 A look at the newspapers of the 1770s reveals news developments clashing with deadlines, a highly partisan media, and bystanders posting confused, sometimes inaccurate reports—in sum, a version of these famous events entirely unlike the neat stories we’re taught in class. Back in 1775, when the Revolutionary War began, America had only one form of mass media: the Colonies’ 38 newspapers. Each paper was generally published once a week. A typical issue was four pages, somewhat larger than a modern tabloid, with most of the news taken from private correspondence, other papers, and ships that had left Europe weeks before. The average circulation was 600 copies. Colonists living in towns away from the coasts had to wait for travelers to ride in with the latest issues. Despite those limitations, the British Empire’s 18th-century newspaper network was the fastest, most thorough way of spreading news that the nation had ever seen. People in Colonial Boston could learn about famine in India. They could read about political maneuvers in London and other capitals. Though readers probably heard by word of mouth about local developments well before they appeared in print, they could read commentary on those events from a range of observers, most writing under pen names. The New-Hampshire Gazette’s account of the Battle of Lexington and Concord. Though politicians frowned on political “factions,” the press was highly partisan. Most newspapers printed essays on only one side of an issue, producing monthlong debates as essays volleyed back and forth between papers. In Boston, the British customs service supported certain newspapers, such as the Boston Chronicle and Boston Post-Boy, by buying stationery from those same printing houses. The town government, usually on the other side, preferred to give contracts to the publishers of the Boston Gazette, the Patriot mouthpiece. Populist media criticism sometimes went beyond decisions about which newspaper to favor; the printer who supported the royal government most fervently, Scottish immigrant John Mein of the Boston Chronicle, was run out of town in late 1769 by an angry crowd of merchants. A few months later, a London supplier asked leading Boston merchant John Hancock to help collect money that Mein owed. Hancock used that fortuitous power of attorney to shut the Boston Chronicle down for good. One of the first accounts of the Tea Party, published in several New England newspapers, shows clear signs of these political biases. Though the piece was signed “An Impartial Observer,” it was carefully written to portray the rioters as scrupulous about other people’s property. They broke a padlock on one ship, the dispatch acknowledged, but quickly replaced it. One man tried to pocket tea for himself, but others seized and pummeled him. Did “An Impartial Observer” recognize any of the men carrying out what became known as the Boston Tea Party? If so, he (or she) didn’t see that information as fit to print. Newspapers published a range of reactions to the Tea Party. Tongue firmly in cheek, the printer of the Pennsylvania Packet reported that all that tea had had an effect: “letters from Boston complain much of the taste of their fish being altered.” The Essex Gazette of Salem printed a resolution from Marshfield, home to a number of supporters of the royal government, condemning the tea destruction as illegal, unjust, and dangerous. Other events that are considered momentous today were at first barely covered by newspapers at all, due to their publishing schedules. The Battle of Lexington and Concord would come to be seen as one of the biggest news stories of the 18th century, but it took place on Wednesday, April 19, 1775, a date that offered a challenge to two Boston print shops that issued their newspapers on Thursdays. Isaiah Thomas of the Massachusetts Spy was already busy relocating from Boston, where he no longer felt safe among the soldiers. Margaret Draper, publisher of the pro-Crown Boston News-Letter, went to press first on April 20, with a single, disclaimer-heavy paragraph about the battle. American Revolutionaries knew the limits of their newspapers better than anybody, but they also saw them as valuable sources, both during and after the war. Thomas Jefferson considered their preservation “a duty.” Massachusetts Spy printer Thomas went on to found the American Antiquarian Society in Worcester, a leading repository of the nation’s early print culture. For the two centuries since, historians have relied on these period newspapers as sources. But to look at them is to realize that the news has never truly been as black and white as we imagine. These early news reports are a “first draft of history”—and a reminder that when it comes to what the big events mean, it has always taken time for the story to settle. Todd Andrlik is a Revolutionary War newspaper archivist, and J.L. Bell is the proprietor of boston1775.net, about New England’s Revolutionary history. Andrlik is the main author of and Bell contributed to “Reporting the Revolutionary War: Before It Was History, It Was News” (Sourcebooks), which reproduces American Revolution-era newspapers with modern analysis (www.beforehistory.com).